In about 1868 to 1871, The Michaux - Perreaux steam powered bicycle was invented, and a tricycle version was later designed. 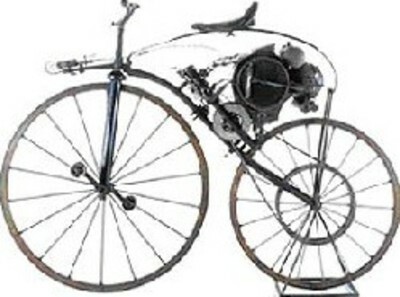 The Michaux brothers had worked with Pierre Lallamet in developing a version of a bicycle with cranks, and the Michaux - Perreax was the Michaux bicycle with a Perreaux steam engine from a sewing machine. The machine had front wheel pedals, and pulleys and drive belts to drive the rear wheel. It had a top speed of about 20 mph. The original machine is in the Musse de I'lle de France, and was displayed in the Guggenhein Museum in New York. Kirkpatrick MacMillan had invented a rear wheel driven bicycle in 1839.